AES President David Scheirman has helped the organization focus on the changing times. The unusually long executive term was due to a membership-approved bylaw change that moved the leadership transition from the annual US AES Convention to the end of the calendar year. “Aligning AES elected officer terms with our fiscal year, which is January 1 to December 31, is best practice to create synergy between an organization’s corporate goals and priorities with its annual budget,” and thereby simplifies corporate governance, says Scheirman. The historic gender balance of the Executive Committee’s five voting members comes at the end of the first year of a new group in the society’s leadership. “One of our most active groups has been Diversity and Inclusion, a sub-set of our Membership Committee. Ensuring a broader global community is more aware of the benefits and rewards of AES membership is a key goal for D&I,” says Scheirman, who is global director, concert and rental business for Bose Professional. Scheirman also notes that the society, in its 70th anniversary year, is seeking a new executive director with the help of Stanton Chase, a global top-ten Forbes-listed executive recruiting firm. The AES is experiencing significant membership growth in several areas outside its traditional core membership base in the USA and Europe, he reports. Latin American membership has increased about 2.4 times over 2017 numbers, and the burgeoning membership in China, which doubled from 2015 to 2017, is up nearly another 50 percent, year-on-year, he says. In China, says Scheirman, AES membership-drive booths appeared in support of CETA’s AES@Palm Expo 2018, the China Entertainment Technology Association’s Pro Audio and Light & Music tradeshow in Beijing and the 2018 Loudspeaker Sourcing Show in Guangzhou. There was also an AES membership-drive team at the 2018 Summer NAMM in Nashville, TN. Another membership outreach initiative has been onsite linkage with compatible organizations and activities attracting audio professionals, he continues. “We have once again co-located our AES 145th Convention with the NAB Show New York.” Following a successful pilot project earlier this year, he adds, the AES@NAMM: Pro Sound Symposium, Live and Studio education and training event will return in 2019 (January 24-27 in Anaheim, CA). Worldwide, the AES added several new sections during 2018, the majority of which are student sections, Scheirman reports: “Our Education Committee has been doing a tremendous job of linking these new student members with high-profile opportunities.” For example, the society’s student recording competitions are increasingly popular, and were included at both European- and USA-based AES conventions, and at regional conferences such as AES Mexico and the AES Latin American Conference in Uruguay. 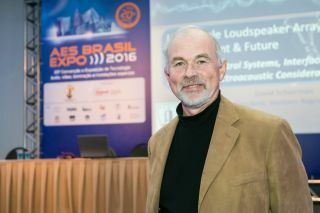 “I was privileged to serve as a judge for the Mexican competition,” says Scheirman, “and I can vouch that the quality of participating contestants, and the educational programs that are producing them, will soon make many of these young audio enthusiasts a force to be reckoned with in the worldwide professional audio industry."